Industrial training is very important for every engineering and management branch. Each student have to take industrial training where they learn in live production environment. Today's project is on industrial training report carried out by Mechanical student on "improvement of incoming quality" and done at Whirlpool of India Ltd. You can also Subscribe to FINAL YEAR PROJECT'S by Email for more such projects and seminar. This report contains many chapters and start with introduction of the company and their vision, mission etc. Other chapters on this industrial training project report focus on Refrigerator and it's working and incoming quality of products. The Refrigeration industry in India is fast growing and with the advent of global brands the industry has woken up to new opportunities and new challenges. Whirlpool’s is associated with India since the year 1987 with the establishment of the joint venture TVS Whirlpool Ltd. Whirlpool Corporation is the world’s leading manufacturer and marketer of major home appliances. 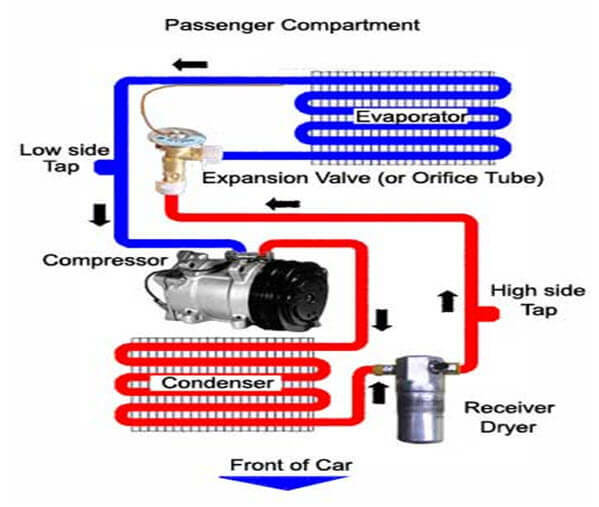 The compressor compresses the ammonia gas. The compressed gas heats up as it is pressurized (orange). 1. The coils on the bank of the refrigerator let the hot ammonia gas dissipate its heat. The ammonia gas condenses into ammonia liquid (dark blue) at high pressure. 2. The high-pressure ammonia liquid flows though the expansion valve. You can think of the expansion valve as a small hole. On one side of the hole is high-pressure ammonia liquid. On the other side of the hole is a low-pressure area (because the compressor is sucking gas out of that side). 3. The liquid ammonia immediately boils and vaporize (light blue), its temperature dropping to-27 F. This makes the inside of the refrigerator cold. 4. The cold ammonia gas is sucked up by the compressor, and the cycle repeats. By the way, if you have ever turned your car off on a hot summer day when you have had the air conditioner running, you may have heard a hissing noise under the hood. That noise is the sound of high-pressure liquid refrigerant flowing through the expansion valve. This report also contains information about plant, assembly area and information about other units and improvement of incoming quality at Whirlpool. Use this report for your reference and study only.